The borough’s Bangladeshi community remained tense and fearful more than a week after two men were gunned down a few blocks from a humble, storefront mosque in the Ozone Park neighborhood of Queens on Aug. 13. Jewel Chowdhury, the general secretary of the Jalalabad Association of America, says the community’s women were hesitant to walk the streets of their neighborhood in traditional dress and men were unwilling to head to Friday prayers unaccompanied. No one was sure if the unprovoked killings would prove an unhappy but isolated incident or the beginning of something much worse. New York police had a suspect in custody—Oscar Morel, a Brooklyn resident—but were still unable to offer a motive in the attack. Among the friends, families and neighbors of the two victims, however, there was considerably less uncertainty. “It was a hate crime,” Chowdhury says bluntly. “I firmly believe that. 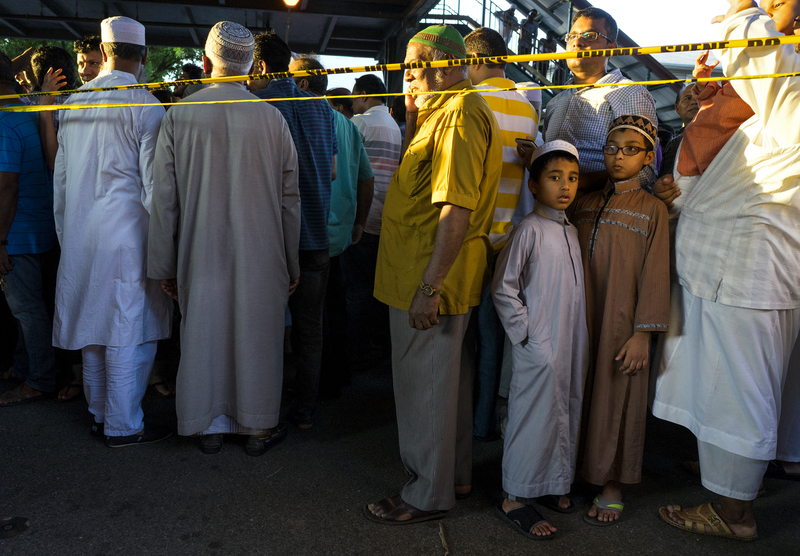 Maulama Akonjee, imam of the Al-Furqan Jame mosque had just delivered the afternoon service and was walking home with Thara Uddin, a member of the mosque, when both men were gunned down in broad daylight. The imam was pronounced dead at the scene and Uddin died a few hours later at Jamaica Hospital Medical Center. The imam was described as a quiet, devout man, a community leader who preached peace. “A man like him cannot be shot dead like this,” one disbelieving community member told local media on the day of the killings. "This was a most horrendous and despicable act that can only be described as a cold-blooded, premeditated assassination," Assistant District Attorney Peter McCormack told local media after announcing Morel’s arrest a day after the shooting. Chowdhury’s organization, a social and advocacy group for immigrants from the Sylhet region of Bangladesh, includes more than 1,000 members from this close-knit community of some 30 to 40,000 strong in Ozone Park. The Bangladeshi immigrant community shares these Ozone Park streets with immigrants from Central and South America, China and other parts of Asia. The neighborhood has long been a launching pad for new arrivals in America; Irish, Italian, Jewish and German immigrants preceded these contemporary first-generations of Southeast Asians in New York. According to Chowdhury, Muslim immigrants in Ozone Park are easily distinguished by their traditional clothing, especially as they come and go to Friday prayers at local mosques. Like other New Yorkers, many immigrants from Bangladesh have experienced some degree of street hassle in Queens—from aggressive panhandling to strong-arm robberies. But in some instances these encounters, Chowdhury said, have escalated to include angry references to religion or national origins, and sometimes inexplicable attacks simply begin that way. Chowdhury, a Queens resident for 29 years, said he has never experienced anything in the past like the hostility toward Muslim immigrants he is seeing now on the streets of New York. He blames the difference on this election season’s heated political rhetoric, especially anti-Muslim hysteria he believes is being inflamed by a former Queens resident, the presidential candidate Donald Trump. While the candidate may not be directly encouraging violence, Chowdhury argues that his comments, particularly his call for a moratorium on immigration by Muslims, have inflamed many and may be provoking a minority of potentially violent people in unpredictable ways. That sentiment, expressed by many who have demonstrated against Islamophobia in the wake of the murders, was quickly countered by a statement from the Trump campaign, which described as “irresponsible and obviously politically motivated” any effort to connect the candidate’s comments or positions with possible hate crimes. As police continue to investigate a possible motive in the attack, Ozone Park’s Muslim residents have been pressing for stronger security measures. Chowdhury said the Jalalabad Association is seeking to put together a meeting with community and police leaders to discuss safety measures around mosques. He thinks additional security cameras and more police patrols will likely be part of whatever additional arrangements are decided. Beyond such precautions he believes better communication among all members of the Ozone Park community is deeply warranted. He invites non-Muslims to visit their neighbors’ mosques, to learn for themselves what is taking place inside them.